Guayusa (gwhy-you-sa) Tea is made from brewing leaves from the guayusa tree, which is a type of holly found in the Amazon region of South America. It is related to yerba mate, but not related to Camellia sinensis and has been used by the native people of the region for millennia for its energy and health-promoting properties. The above caffeine amount is derived from using 3 g of traditional guayusa tea and steeped for 4-6 minutes in 8 fl oz of hot water. Guayusa has a higher antioxidant profile than green tea and much more caffeine, But like green tea, caffeine content can vary. Although used by western missionaries in the 1700's, it seems guayusa tea is just now becoming popular in the mainstream. If you want to try guayusa, just make sure you buy 100% pure varieties in order to experience what this tea has to offer. 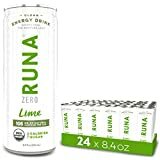 The above caffeine amounts are based on what the brand RUNA Guayusa Tea has published concerning their products. 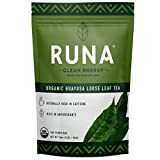 WAYKANA Original Green Guayusa Tea Bags (16 count) | Healthy Coffee Alternative | Boost Energy, Performance & Mental Clarity | Antioxidant Tea | Naturally Sweet No bitterness | Feel the Jaguar Energy! Guayusa Tea contains 12.38 mgs of caffeine per fluid ounce (41.84mg/100 ml).